Every day, coal companies in Appalachia use over 4 million pounds of explosives to blast the tops off densely-forested Appalachian Mountains. That's more explosive power than the Hiroshima atomic bomb. What happens when coal companies flatten the mountains directly above Appalachian communities? 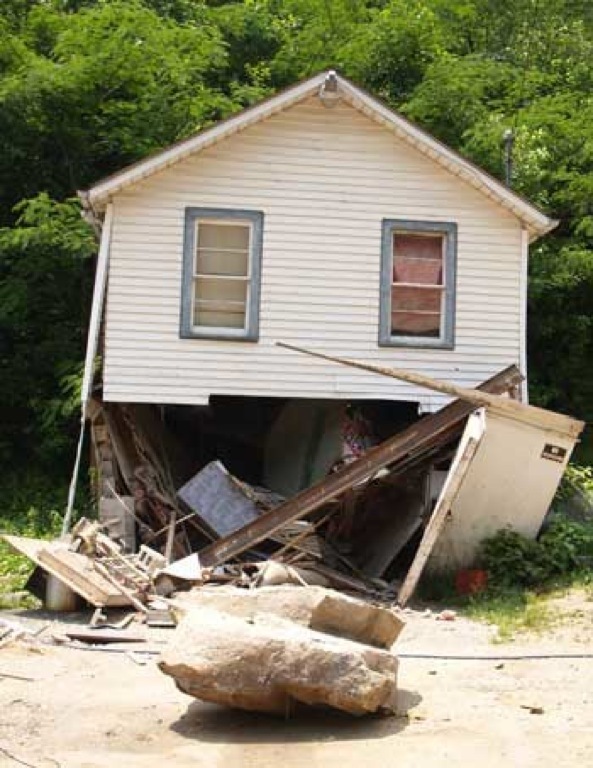 About a year ago an elderly Floyd County, Kentucky couple -- both deaf and living on a fixed income -- were approached by a coal company offering money to strip mine their mountainside. They refused to sell their mountain. 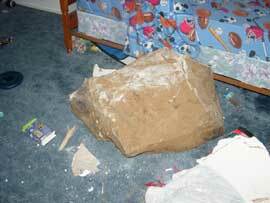 Yet on Friday, Aug 28th a massive boulder crashed from the Frasure Creek Mining strip job into the bedroom of Billy and Eileen Tussy. Thankfully, the Tussys weren't home at the time. The federal Office of Surface Mining responded and determined the boulder was allegedly caused by blasting at the Frasure Creek mine. The mining operation was stopped pending an investigation and mediation. 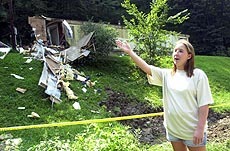 The Tussys and three other families were evacuated to motels. On Friday, the family met with Floyd County Kentuckians for the Commonwealth members, Appalachian Citizens Law Center attorney Mary Cromer and representatives of Austin Powder Company, the subcontractor for Frasure Creek Mining, who allegedly set the blast. The Tussys do not want to return to their property for fear of more boulders. They hope to put a new mobile home near relatives elsewhere. The company representatives made no offer but will meet with the family again. When asked if the company plans to apologize to the family, an Austin Powder Company spokeman said, "We don't really go there." All the Tussys want is a safe and modest home near family and friends -- which is what they had before Frasure Creek Mining became their neighbor. Citizens groups are starting a campaign to pressure Austin Powder to deal fairly with the Tussy family. Call Austin Powder Company's Chairman of the Board, William Davis (216) 464-2400 and urge that he replaces the Tussy family's home and offers an apology. Or go here to email Mr Davis. As tragic as these incidents are, they are not isolated. 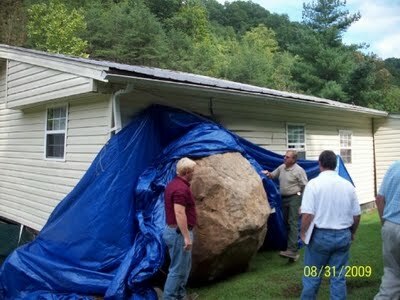 Several times over the past five years, huge boulders from coal mining operations have crashed into homes.